A sneaky Ohio group, using a name similar to ours, is accusing a Cleveland-area real-estate developer of making false and misleading claims in a local zoning fight. But the fact is we have nothing to do with “SouthEuclidFactCheck.org” and don’t endorse the statements that group is making in mailers and on a website. Ironically, one mailer sent by this group says that “facts are too often replaced by lies and distortions,” and it says that the group, on the other hand, gives “just the facts.” Actually, the mailers and website give no information at all about who or what is behind this group, not even a return address or a phone number. The owner of the website address is deliberately hidden behind a proxy registration. The group’s materials say it is “a project of Ohio Fact Check,” but we’ve never heard of such a group and could find no evidence that it exists. The zoning fight concerns a proposed shopping center that would occupy about 40 acres of the former Oakwood Country Club, and would include big-box retail stores. Another 20 acres would be donated to become a park, according to the developer, Mitchell Schneider of First Interstate Properties Ltd. The South Euclid, Ohio, city council voted 7 to 0 to rezone the 60-acre property to allow the development, but opponents got up a signature drive and put a measure — Question 96 — on the local ballot. Those who oppose the development urge a “no” vote, which would disapprove the council’s rezoning of the property from residential to commercial. We won’t try to sort out the claims and counter-claims about taxes, jobs and traffic in this local zoning fight, and we certainly take no position for or against the shopping center. 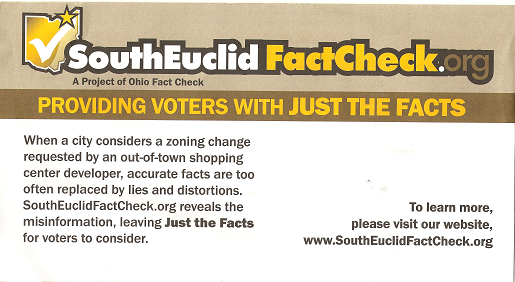 We will point out that this phony “factcheck” group refers to First Interstate as an “out-of-town shopping center developer.” In reality, the developer’s headquarters is in the nearby Cleveland suburb of Lyndhurst, which, according to Google Maps, is 3.3 miles from the Oakwood property, less than a 10-minute drive away. What we find most objectionable, however, is for any group to use a name that implies it is associated with us when it’s not, especially when its true identity and sources of funding are deliberately hidden. That’s the very definition of a front group. We hope the voters of South Euclid, Ohio, are not deceived. 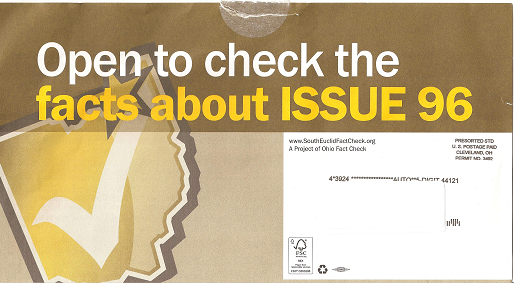 It has been brought to our attention that the name of our organization and project, Ohio Fact Check and South Euclid Fact Check may lead people to assume that we are affiliated with or a part of FactCheck.org, a program of the Annenberg Public Policy Center. Ohio Fact Check and South Euclid Fact Check ARE NOT AFFILIATED IN ANY WAY with Fact Check.org or the Annenberg Public Policy Center. We apologize for any confusion this has created. We appreciate the clarification and accept the apology. But of course, no such clarification appeared on the mailers that the group previously sent to voters. And so far, there has been no disclosure of who is funding this front group. Update, Nov. 10: The front group was not successful in swaying enough voters to block the development. The city council’s decision to rezone the property was affirmed, with 55 percent of voters saying “yes” to the South Euclid zoning referendum.